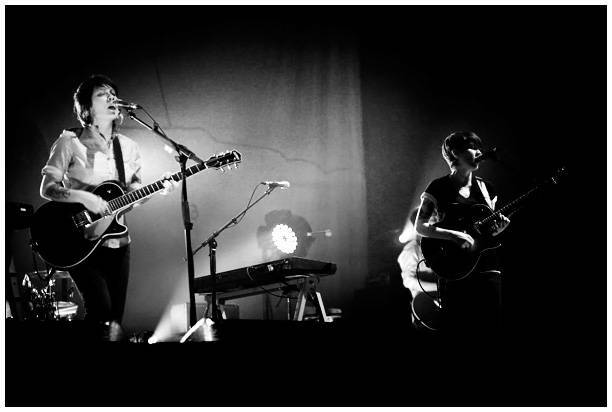 Canadian twins Tegan and Sara kicked off their North American tour with two shows on Jan. 5 and 6 at Vancouver’s gorgeous Orpheum Theatre. I missed first opening act Astronautalis due to box office issues, but as much as walking in at the end of a set counts, he seemed to be quite well received by the crowd. I made it in time for second openers Aussie duo An Horse, made up of vocalist/guitarist Kate Cooper and drummer/back-up vocalist Damon Cox. Before I knew anything about the two-part group from Brisbane, I was handed a copy of their album Rearrange Beds last March and was asked to review it. The first thing that came to my mind was how comparable their sound was to Tegan and Sara, with the added touch of male vocals. 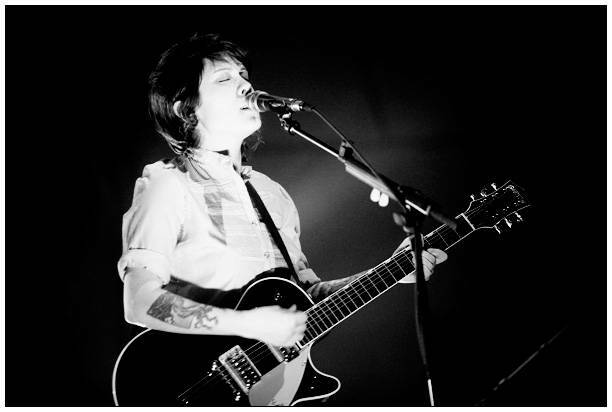 Turns out they were actually discovered by Tegan and Sara while Sarah and Damon were working at a Brisbane record store – go figure. The two of them laughed off the fact that over half of entire front of the theatre’s seats were yet to be filled and Kate told two stories of how she embarrassed herself that day: being hit in the head by a parking garage door and being walked in on in the ladies bathroom. The pair played surprisingly full-sounding songs with awesome lyrics, like “Postcard”‘s “Oh Postcards, romantic when they are in tact.” Some guitar riffs were reminiscent of the Killers’ Hot Fussalbum. 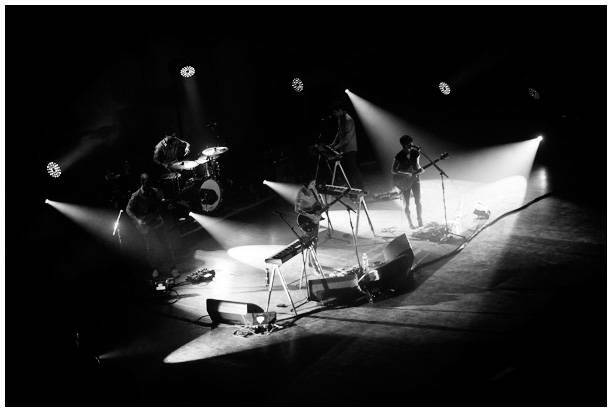 After about an hour of opening acts, Tegan and Sara, who collaborated their most recent album via Internet from across the nation (Vancouver-Montreal), walked quietly onto the stage with the lights dimmed against a backdrop of paint-by-numbers, followed by a trio of musicians. Their short black hair was parted on the same side. They wore matching jean blouses and black skinnies. 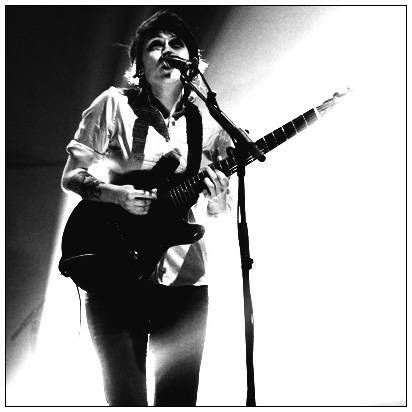 Tegan had black flat sneakers and Sara, flat red leather oxfords as they opened up their 27-song set with “Arrow” from their latest album, Sainthood, from which the majority of their set list came from. 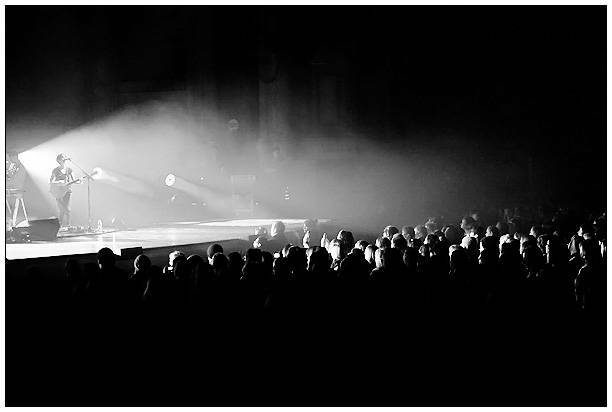 For a sit-down show at the Orpheum, the crowd was surprisingly responsive to the girls as they directed the audience to stand up and sit down and between songs. 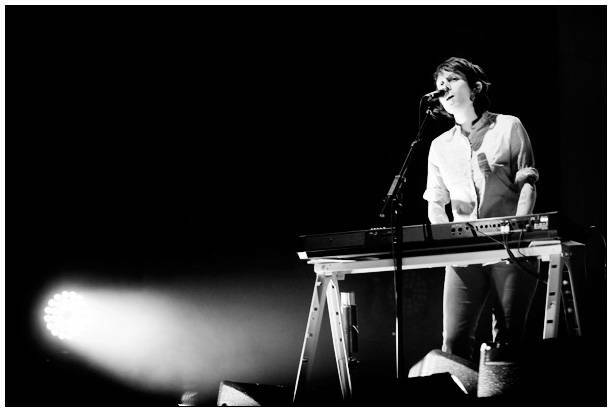 “We think we’re hilarious,” said Tegan as she began describing how weird it was playing two shows in a row in the same city. Throughout the evening I heard nearly every person around me say on at least one occasion, “They are so cute!” And that they are – adorable really, with their sisterly anecdotes and banter, silly stories and many heartfelt thank-yous to the crowd. 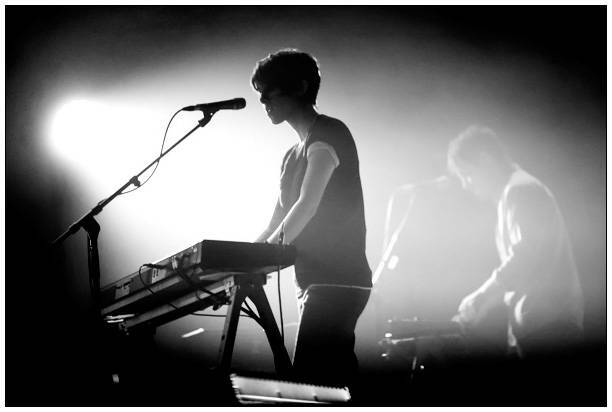 Tegan teased Sara about her prepubescent teenage boy traits and crushes on Alicia Keys and Rihanna, and told a story about a teenage girl who was sending her inappropriate photos of herself, and the desperate measures she took to make the girl stop so she didn’t end up in jail – one long text message. The show was remarkably refreshing. 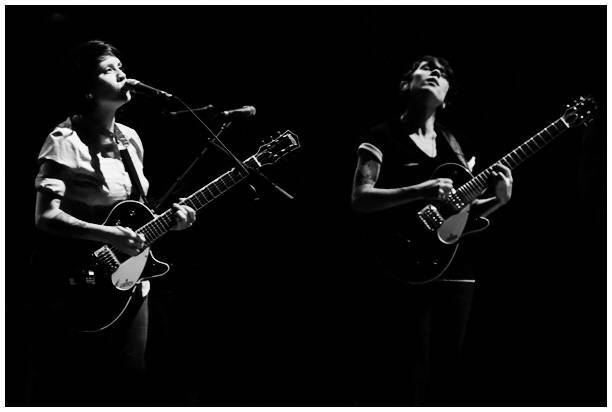 Personally, I’m much more a fan of their slower acoustic songs rather than the emo-punk whining songs I can only take so much of, but the girls balanced out the two quite nicely with well-known favorites from older albums like “Walking With a Ghost”, “Where Does the Good Go”, “The Con” and “Speak Slow”. 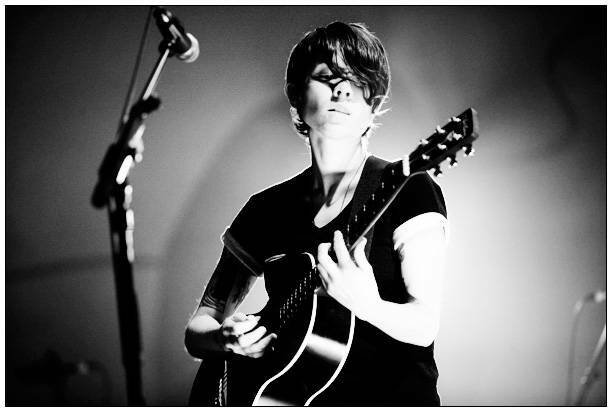 During the latter, Tegan stumbled upon a few words, made a shocked face toward Sara and but they both quickly shrugged it off and continued. The only truly negative thing I can say about the evening is that the light show was slightly overbearing and suited much more for a venue like the Commodore where members of the audience can dance or move out of the way to avoid the intense glare. Well, that and the fact that for the first six songs the bass was way too strong for the type of show. At one point my seat was vibrating so hard I could have fallen off – actually. The girl next to me turned and said, “This is a disaster!” The music faded before the end of her sentence and the entire row turned toward us – awkward. Thankfully though, they fixed it soon after and the rest of the show went smoothly. For the encore, smoke filled the stage and the light show was fantastic. The girls came out and did an incredible acoustic version of “Back in Your Head” with Tegan gently tapping the beat of the song out on a xylophone. Their harmonizing gave me goose bumps. They then did an acoustic version of their collaboration with Tiesto, “Feel It In My Bones”, with Sara on the keyboard. For the final song “Living Room”, the band came back out and got the crowd on their feet again. Five girls came up from the back of the room and stood in front of me, dancing and looking like they were having seizures but hey – they were having a good time. By the end of the night, the entire crowd was standing up and dancing. If I could describe the girls in five words: Cute, witty, humorous, genuine and talented. But I could do it in two, they were: simply charming. 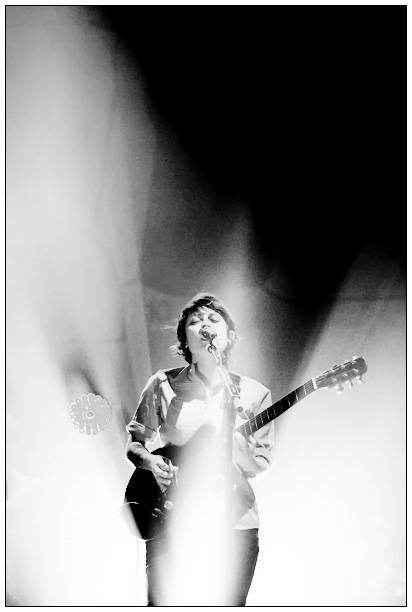 This entry was posted in concert reviews and tagged female singer songwriters, Orpheum Theatre, Tegan and Sara, Vancouver concerts. Bookmark the permalink. I cant wait til tegan and sara hit Australia.